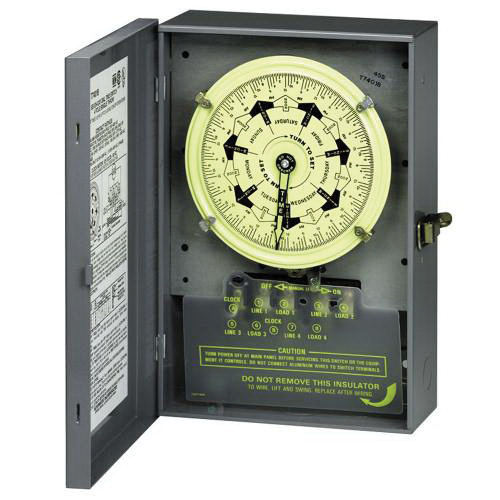 Intermatic T700B Series 4-Pole Mechanical timer switch with 7-day timing, has voltage rating of 120-Volt AC at 60-Hz. It has a dimension of 9-Inch x 3.75-Inch x 13.125-Inch. This timer switch has current rating of 40-Amps at 120 - 480-Volt AC for resistive, 40-Amps at 120 - 277-Volt AC for inductive, 16-Amps at 277-Volt AC for electronic ballast and 40-Amps at 120 - 277-Volt AC for tungsten. It has contact rating of 40-Amps at 120 - 277-Volt AC for resistive/inductive/tungsten, 16-Amps at 277-Volt AC for electronic ballast and 1000 VA at 120 - 277-Volt AC for pilot duty. This gray colored timer switch features steel construction, ON/OFF action, 2NO/2NC contact configuration, NEMA type-1 enclosure and operates at 28 cycles. It has maximum power rating of 2 hp motor at 120-Volt AC, 5 hp motor at 240-Volt AC for single-phase and 10 hp motor at 240-Volt AC, 7-1/2 hp motor at 208-Volt AC for three-phase. This timer switch consumes power of up to 3-Watts and supports wall mounting. It accommodates a conductor of size 14 - 8-AWG and has temperature rating of -40 to 54 deg C. This timer switch is great for heating, air conditioning, pumps, indoor/outdoor lighting, motors, signs, filters and fans. Timer switch is cCSAus/cULus listed.